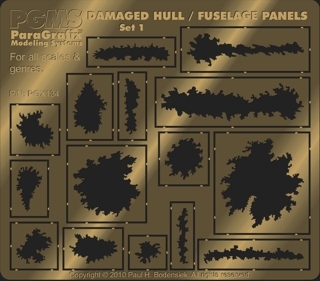 Creating realistic damaged hull and fuselage panels has always been difficult - either the panels are far too thick (being just holes cut in the side of a model), the edges are too smooth, or the plastic has been unrealistically damaged by attempts to "burn" it with a torch or soldering iron. Now, thanks to the first set of photoetched hull plates from ParaGrafix, all of these problems have been solved. Simply cut an appropriate sized holes in the model and glue one of the panels into place. Fifteen different designs and sizes for a variety of alternate damage scenarios. 0.005" thick brass sheet provides suitable plating thickness for many different scales. Contours to the shape of most simple hulls/fuselages without annealing. Enhance the detail by bending the ragged edges inward (for an external hit) or outward (for an internal explosion). Generous 1/16" (1.6mm) border around each "breach" for glueing. Can be (carefully) trimmed to shape with shears for fitting in tight areas. Suitable for all types of models: science-fiction, aircraft, armor, automotive (makes great rust) ... you name it! Modeler can add internal details to enhance the realism. The example below of the Moebius Models Viper Mk 2 was quickly achieved by cutting holes in the kit, then adhering the photoetched parts and adding bits from the spares box behind them. A bit of sanding would allow the PE parts to be recessed slightly and be flush with the kit's exterior.